Good police officers are often promoted into supervisory positions with little or no training for what makes a good manager. Effective Police Supervision provides readers with an understanding of the group behaviors and organizational dynamics necessary to understand the fundamentals of police administration. 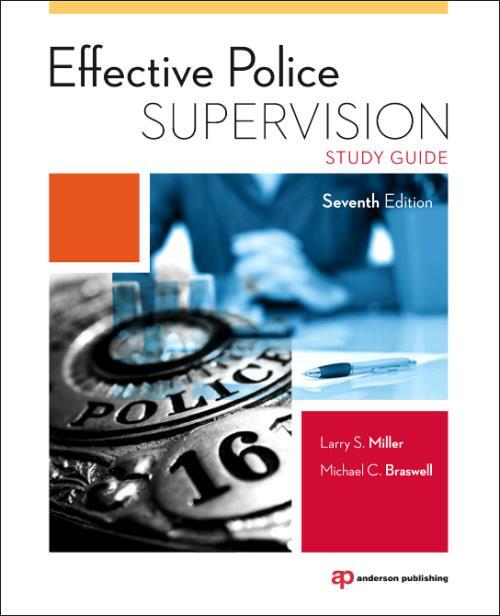 The Effective Police Supervision Study Guide, which includes quizzes and other study tools, gives students, as well as professionals training for promotional exams, a way to review the material and be fully prepared for examinations and the world of police supervision. This new edition, like the new edition of the textbook it accompanies, includes information on the following topics: police accountability, police involvement with news media, dealing with social media, updates on legal considerations, and avoiding scandals. Larry S. Miller is Distinguished Professor and Chair of Criminal Justice and Criminology at East Tennessee State University (ETSU). He received his Bachelor of Science from ETSU, a Master of Science from Eastern Kentucky University, and his Ph.D. in Health & Safety with collaterals in Forensic Anthropology and Criminology from The University of Tennessee. Miller, who has worked as a police officer, criminal investigator, and crime laboratory director, teaches in the area of law enforcement and is the author of several books on topics including criminal investigation, criminal justice report writing, police photography, and more. Dr. Michael C. Braswell is Professor Emeritus of Criminal Justice and Criminology at East Tennessee State University (ETSU). Braswell received his Bachelor of Arts in Psychology from Mercer University in 1969, a Master of Arts in Psychology from West Georgia College in 1970, his Ed.S. in Rehabilitation/Correctional Counseling from the University of Georgia in 1973, and his Doctorate in Counseling Psychology from the University of Southern Mississippi. A former prison psychologist, he taught ethics and human relations courses for more than 30 years at East Tennessee State University. He has published books on ethics, peacemaking, and correctional counseling as well as two novels and a short story collection.